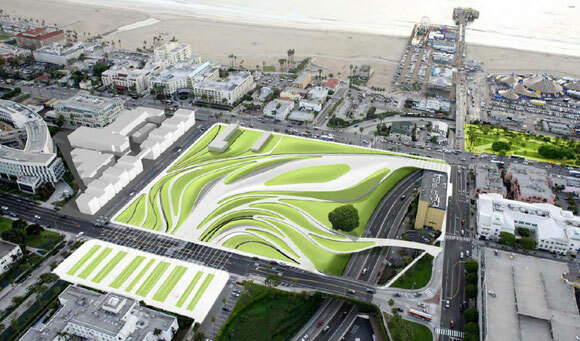 Santa Monica's urban designers offered City Council the schematic at left to show future traffic flows from downtown through the new Tongva Park. Tourists will move from downtown shops and hotels and the new light rail line directly towards Palisades Park. This schematic shows exactly how much the city depends on Palisades Park. Look for Palisades Park: it's the green space at the upper right corner. One important city industry, an industry critical to the economic viability of our city, absolutely depends on Palisades Park: tourism. 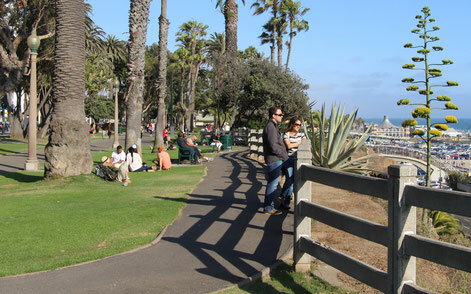 Palisades Park provides shade, water, restrooms, green lawns, benches and spectacular views! 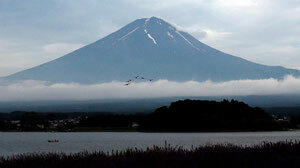 It's a enhancement for tourists on whom the city greatly depends. 1.53 billion dollars is generated by tourism each year. Over 70% of hotel visitors do not use a car once they arrive in Santa Monica. 12,200 jobs are supported by tourism. The majority of hotels that service these visitor are located near or adjacent to Palisades Park. 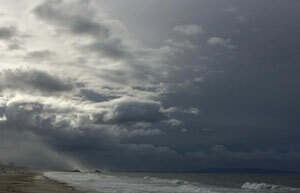 At Palisades Park tourists find interesting historic monuments, comfortable benches, and convenient public amenities which make a visit to Santa Monica a relaxing and refreshing sojourn. It serves our visitors quite well and doesn't them cost a dime. Here tourists find a happy respite from local attractions. They picnic on the grasses, share experiences, stroll along the bluffs, enjoy the spectacular sunsets, all within a beautiful natural environment of lush lawns, exotic plants, beautiful trees, and a magnificent rose garden. It's a good reason our city should make every effort to protect, preserve, and restore Palisades Park. Today is the right time and Palisades Park is certainly the right place for our city to focus its energies to promote tourism, sustainability, and wellness altogether. At left Mayor Pam Connor promotes tourism. Her other goals are for city wellness and sustainability. 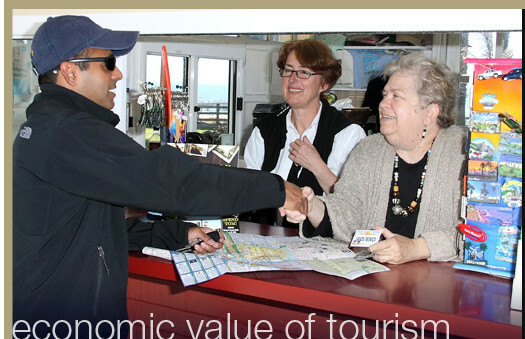 "The Santa Monica Convention & Visitors Bureau has been conducting visitor profile and economic impact studies since 1983. 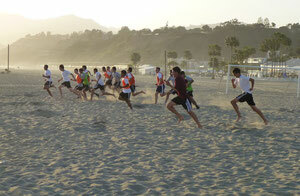 This research is meant to assess the economic value that tourism affords Santa Monica as a destination city."